It is easy to create your own blog. Google is providing this service. 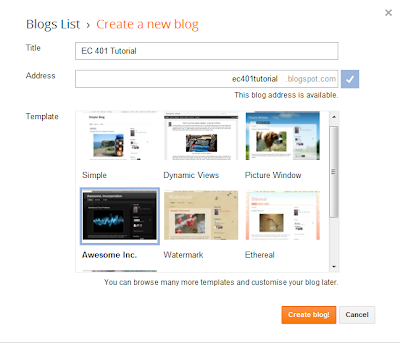 So now anyone can easily create his/her own blog and also can post on there blog. Let's Start. You have to create gmail account. you can create from here. If you have already then it's good. Step 1 : Click on the following link and login with your gmail account. Step 2 : Now you will see Blogger Dashboard. You have to click on "New Blog" Button which is at left side. Step 3 : Just Fill up your blog title, Blog Address and Select your blog Template. and click on Create Blog Button. Thats it...!!! Congratulation your blog has been created. Now you can post on your blog. To learn How you can post . Click Here.